Enjoy luxury at its finest at Crescent Shores 1501. 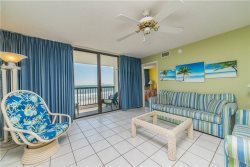 This fully upgraded 4 bedroom corner unit offers unparalleled views of the beach and great Atlantic and upscale furnishings like leather furniture, tile and wood floors, granite counter tops, stainless steel appliances, and tasteful modern decor. You'll be in awe when you open the front door to a spacious floor plan with 4 full bedrooms, large living room, and fully equipped kitchen. The master bedroom treats you to oceanfront views, balcony access, a lavish private bath, and cable TV. Your guests will thank you after they see their own accommodations. 2 of the 3 guestrooms even have ocean views! There's even an assortment of books and movies for your entertainment. Take advantage of the on-site amenities, such as indoor and outdoor pools, hot tub, lazy river, and an exercise room. Within walking distance are shops, ice cream, and Molly Darcy's Irish Pub next door. Take your vacation up a notch and call us now to book this incredible Crescent Shores condo!